Nick Lake worked in partnership with Visit Idaho to create this Travel Tip. A drive through Idaho’s Sawtooth Mountains is always stunning: craggy peaks heaped in stacks above emerald rivers that parallel the highway; aromatic Ponderosa Pines speckled across tawny hillsides; a mountainous wonderland. 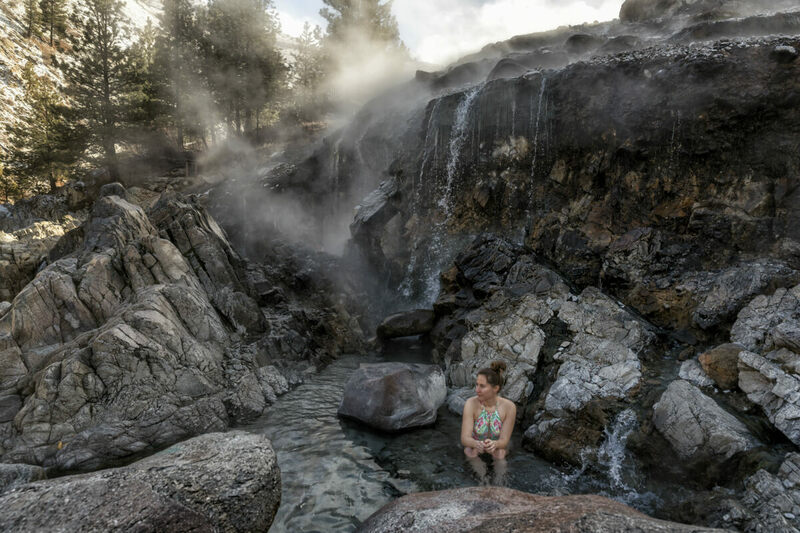 But when the mercury drops in the colder months, evidence of a whole other wonder can be seen: steam drifting up along the water’s edge–signs of geothermal magic bubbling out of fissures in the rock inviting you in for a dreamy soak. The hike is worth the soak. Photo Credit: Nick Lake. I set out on a road trip with four friends seeking Idaho’s most idyllic and picturesque hot springs, traveling in a loop from McCall to Salmon along the famed and scenic Banks-Lowman Road (Wildlife Canyon Scenic Byway) and Ponderosa Pine Scenic Byway, through Stanley and Challis along the way. Even though the scenery changed from prairie to mountains to scrubby hill country, two things remained constant: the air was cold and the springs were hot. Our first stop was just outside McCall at Trail Creek Hot Springs. Some 19 miles down a snow-packed road we found a turnoff scattered with a few cars and telltale steam rising out of the forest. 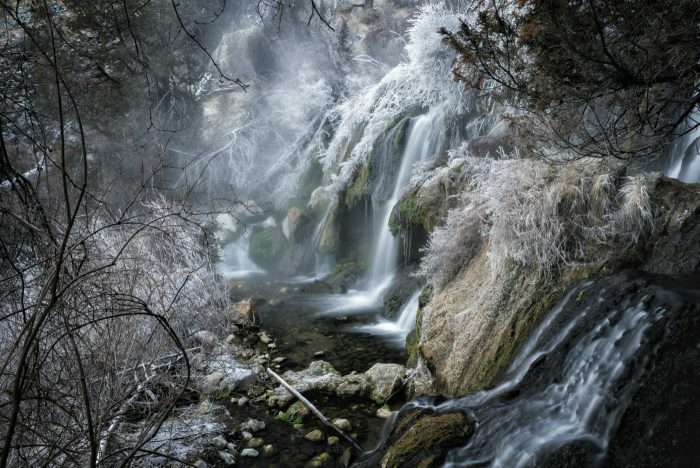 The quick hike down to the springs was treacherous at best as the snow had been scraped and slickened into ice by other soakers. A few ropes helped us keep our footing, but micro-spikes were key on both on the ascent and descent. The pools themselves were a perfect temperature and not too crowded (even on a Friday evening). A series of separate baths have been built along the creek, fed by hot water cascading down the rocks above, getting hotter as you head upstream. After a quiet night in Garden Valley, we ventured east and just before we reached the tiny hamlet of Lowman we found Pine Flats Hot Spring. 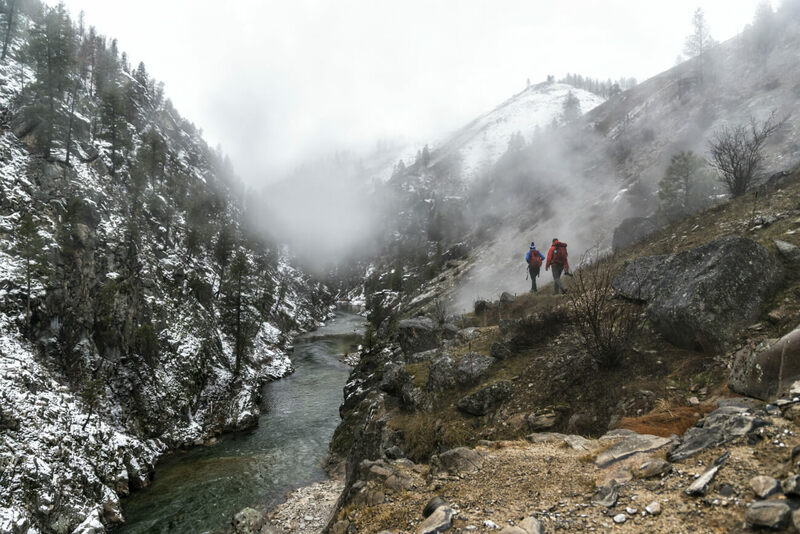 The campground that sits adjacent to the hot springs is typically bustling in the summer months, but in winter the gate at the road is closed and accessing the springs requires a bit of a walk–first on a snowy road, then a well-maintained trail. This extra approach keeps the springs much quieter on a winter afternoon. Pine Flats is a series of pools set on a cliff above the Payette River, many fed by waterfall. There’s even an iconic hot waterfall that cascades down some 20 feet off the cliffside. We were there on a particularly foggy afternoon, which played wonderfully along the riverbank and up the surrounding mountainsides. Kirkham Hot Springs. Photo Credit: Nick Lake. 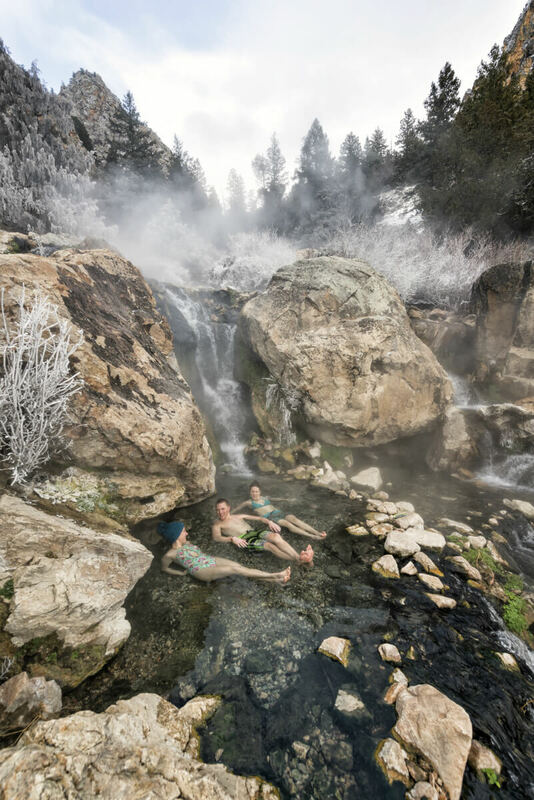 We began the third day of our trip at the popular and easily accessible Kirkham Hot Springs, where an early start afforded us our pick of a handful of perfect pools near the parking area. Even though the forecast called for a blizzard up the pass a few miles away, it was a gorgeous, near-bluebird morning down on the river. As the crowds gathered, we picked our way up the river and found some more secluded tiny pools right at the river’s edge, where we watched the river rush by while a beaver played in the whitewater. Scenic river views. Photo Credit: Nick Lake. Moving on, we braved the blizzard and, just after passing through Stanley, noticed a commotion on the side of the road. 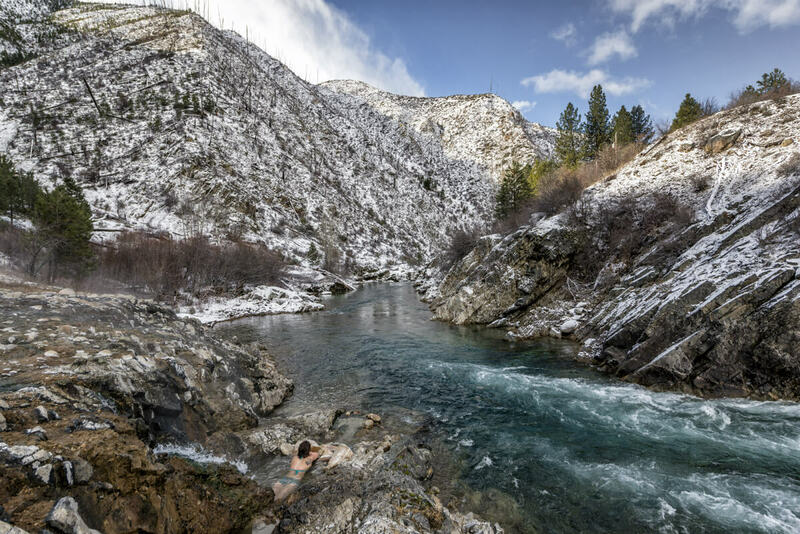 It was Boat Box Hot Spring, a cauldron perched alongside the Salmon River filled with hot spring water. We couldn’t pass up an opportunity to soak for a few minutes in this iconic tub and the crowd we’d encountered there happened to be leaving as we arrived, so we indulged as fat snowflakes drifted down around us. We didn’t dally too long as the crown jewel of our trip still awaited: Goldbug Hot Springs. 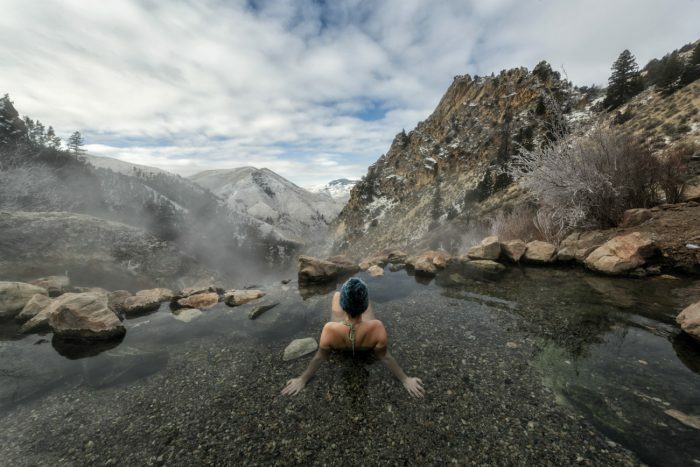 Dreamy winter hot pools. Photo Credit: Nick Lake. Goldbug is a hot springer’s dream and the hike in protects it a bit from the masses. A few miles south of the town of Salmon, the trail begins on a dead-end road through private property (so please be respectful of the landowners who allow passage through their ranches). The trail quickly gains several hundred feet of elevation on switchbacks through sagebrush-covered hills before leveling out and leading on to Salmon-Challis National Forest land. The trail is mostly open and the views towards the peaks are stunning. Gold Bug is pure magic. Photo Credit: Nick Lake. After another brief climb through a grouping of juniper trees, we started to find frozen vegetation around the river, a telltale sign of freezing steam. The cascading river began forming into pools which got progressively hotter as we ascended the notch between the peaks. Even though the air temperature was hovering around zero degrees, the first pool we settled into was a lovely 108. Though our hair froze, we lounged in the steamy pools and watched the valley below–a perfect ending to a life list trip. Sit back and relax. Photo Credit: Nick Lake. Nick Lake is a freelance photographer, writer, and videographer living in Seattle, Washington. He loves to tell stories about adventures in the outdoors and you can usually find him in the mountains hiking or skiing with his wife and puppy. Follow his adventures on his Website, Instagram, and Facebook. Feature image credited to Nick Lake.